This tranquil setting, tucked into a wooded area crowning Cooper Mountain, is one of THPRD's most unique properties. The 68-acre property, constructed for Belle Ainsworth Jenkins and her husband Ralph more than 100 years ago, was purchased in 1975. The buildings and grounds represent a vanishing lifestyle; they have been preserved and maintained by the Park District as a service to residents, who enjoy its many benefits, including: trails, a learning garden, exquisite gardens, and indoor-outdoor locations suitable for private events. For your next big outing - family reunion, company picnic, wedding or birthday party - consider Jenkins Estate. Rentals are managed by Dalton's Northwest Catering. Visit their Web site for more information on any of the areas described below. 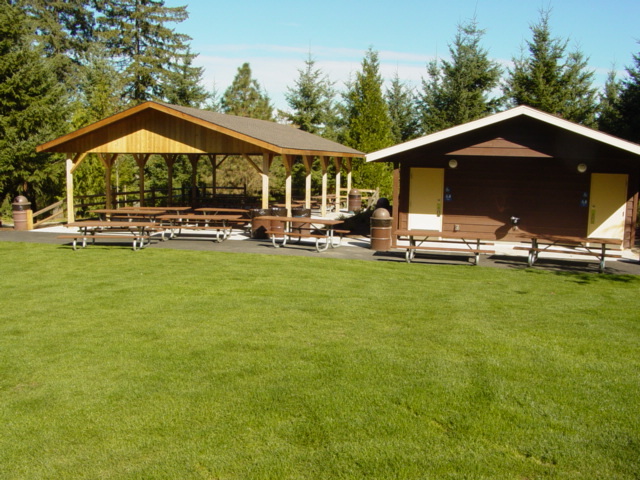 This outdoor picnic area can accommodate up to 200 guests, with limited parking available. It is available for rental June-September; weekends only. Few wedding sites in Oregon can match the splendor of Jenkins Estate. Lush gardens and views of the Tualatin Valley provide a truly stunning backdrop. Tea House: If you're looking for an outdoor ceremony in a wooded setting, the Tea House is the perfect spot for up to 150 guests. 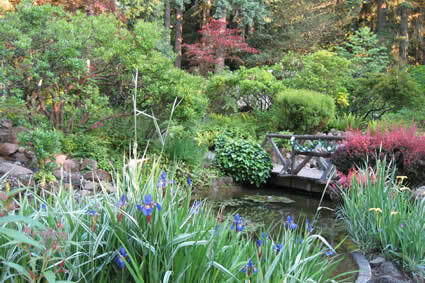 A bridge and scenic pond area allow for a grand entrance. Belle's Haven: For a more intimate ceremony with up to 100 guests, consider Belle's Haven. Surrounded by beautiful flowers and trees, this location provides the perfect backdrop. Meadow: The expansive Meadow can accommodate up to 225 guests. It is surrounded by green trees, blooming bushes and colorful flowers. For the reception, guests can choose the historic Main House or Stable. Main House: Patterned after a hunting lodge built for the English royal family, the Main House has a full-length veranda porch, beamed ceilings, stone and brick fireplaces, solid maple floors and ornate light fixtures. Guests will enjoy the beautiful views from this building and the outdoor dancing area. Accommodates up to 175 guests in the summer. Stable: A handsomely renovated horse barn, the two-story stable features original fir tongue-and-groove boards. Guests are seated in stalls downstairs. Upstairs includes a great wood dance floor and stage area. An outdoor patio provides additional seating. Accommodates up to 225 guests in the summer. Dalton's Northwest Catering manages property rentals and provides catering. To book your date or tour the facilities, contact Dalton's Northwest Catering directly. 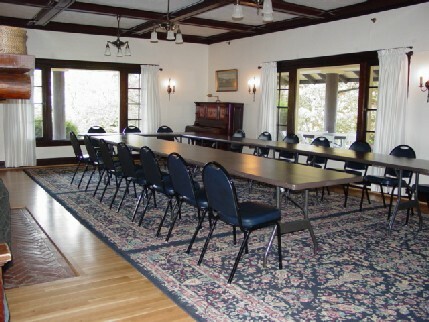 Private rentals additional space for breakout rooms and/or alternate seating for meals. For additional information about building setup, accommodations, rental rates, and catering options, contact Dave's Northwest Catering.